The end of a year and start of another is often when we ask ourselves ‘What have I achieved?’ – that year, in our career, in life, or in achieving our dreams. It’s also when we challenge ourselves with ‘new year’s resolutions’ to achieve goals in the year ahead. Many of us make resolutions such as losing weight, signing-up at the gym or giving-up smoking, all of which ultimately come down to how much we want to succeed. In many respects a career resolution is similar – it means making extra effort, staying on track and keeping your eye on the prize. If you are reading this it is likely that you, like many of our trainees at this time of year, have had time for reflect, looked at where you are at, given yourself a pep talk and set a target for the year ahead. Doing this at the start of the year means you have a ‘clean slate’, a starting point and can set a deadline to aim for. Okay, so you are literally raring to go! Whether you are looking to make a complete career change or learn new skills to take-on a new challenge, we can help. We train drivers from a wide range of backgrounds which typically include relative newcomers who have seen the shortage in HGV drivers and want to start a driving career, professional drivers looking to improve their skills to progress in their careers, medical professionals wanting to learn to drive an ambulance and enthusiasts or professionals needing to tow horseboxes or trailers. That’s just to mention a few of the people we provide training for across our wide range of driver training courses! If you are looking to train to drive a type of vehicle and obtain a licence we have put together a brief guide to help you get started. Get professional advice – Our training team have a wealth of experience in the industry and can offer professional advice on driving and potential career opportunities via our network of industry contacts, especially with an ever-increasing demand for HGV drivers. Our team can provide information on the licences you need, the training courses and the processes involved. At RSM we offer a range of training options and a Starter Pack with all the necessary application forms and information you need to get you started. Set Clear Goals – What do you want to achieve? List the steps required to get there and set a target to complete it. Take the next step! – When you know what you want to achieve and how to there it’s easier to focus. Make a start and try to achieve a task each day or week. Keep a positive attitude and continue to work hard in your job, as knowing you are making progress will make you feel good and a glowing reference goes a long way with prospective employers. Apply for your Provisional Licence by completing the application forms provided in our Starter Pack. We will arrange your Drivers Medical test for you. Start learning the theory. We recommend start as early as possible with the Online study program for Theory Multiple Choice, Hazard Perception & Module 2 CPC tests provided. Use Theory Test Pro to prepare for the test. ( Link). Try to learn something new every day. Attend your Drivers Medical Test. After the medical you will need to send the D2 & D4 form, along with your driving licence photocard, to the DVSA in the envelope we provided. Apply for your Provisional Licence. It can take unto 3 weeks for the DVSA to return your licence. In the meantime, keep studying the theory. Once you have received your Provisional Licence contact our Customer Service team and we will book your tests for you. Take the Theory and Hazard tests and contact our customer services team to book and schedule your driver training course. We offer training Monday to Friday, but if you are working you may wish to consider weekend training sessions or a week on an intensive training course. Start training – Our instructor will take you through the training program step by step and you will practice the required skills to be a competent driver and pass your Practical test. Once we have made an initial assessment of your ability your driving test will be booked. Take your Practical driving test. Once you have passed your Practical driving test, you will need to obtain a Drivers Certificate of Professional Competence (Drivers CPC) before you are allowed to drive commercially. You will need to complete either the Initial CPC OR 35 hours Periodic CPC (depending on your work/how long your licence has been held). Speak to our customer service team for assistance with this. One last piece of advice. Where possible keep refreshing, updating and expanding your skills. If your employer offers paid for training courses, make the most of them, especially if they involve new and transferable skills or qualifications that could either benefit you or create a wider choice of career opportunities. For more information and advice on our courses please speak to a member of our Customer Service team. 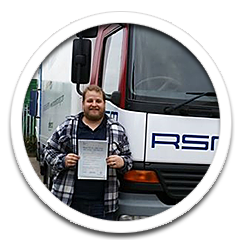 Alternatively, use the Contact Us page to submit your details and obtain a free vocational pack containing the relevant forms and information to apply for your provisional licence and start your commercial driving career.